Measuring Cups and Spoons Set-11 Piece - Amazon Pre Black Friday! Measuring Cups and Spoons Set-11 Piece – Amazon Pre Black Friday! ✓ MULTIPLE SIZES: Meet all your needs on cooking and baking. 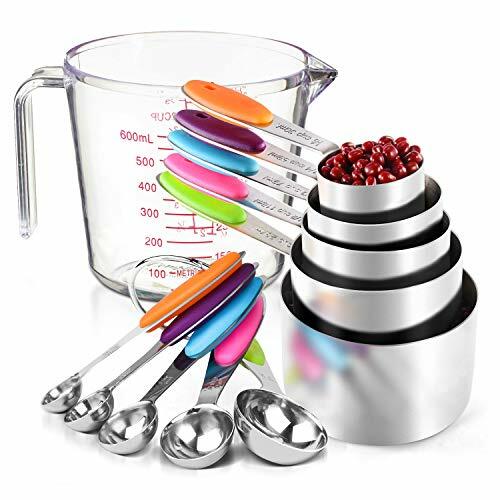 Includes 5 stainless steel measuring cups (1/8 cup,1/4 cup, 1/3 cup, 1/2 cup, 2/3 cup, 3/4 cup, 1 cup) 1 plastic transparent measuring cup (2 ½ cups) and 5 stainless steel measuring spoons (1/4 tsp, 1/2 tsp, 1 tsp, 1 tsp, 1/2, 1 tbsp). ✓ STURDY AND DURABLE: Made of unbreakable high quality rustproof heavy duty, mirror-polished 18/8 304 stainless steel. Our handles will never bend when handling dry or wet ingredients. ✓ ELEGANT DESIGN: Oval mouth cup design looks awesome and makes it very easy to pour the ingredients. The nesting option is great for storage space and neatness. ✓ EASY CARE: The stainless steel measuring cups and spoons set (10pcs) is dishwasher safe. The transparent plastic measuring cup is hand wash recommended. ✓ 100% SATISFACTION GUARANTEED! If you face any issue, there is no need to worry because we've got you covered. Just let us know and we will resolve any issue you encounter as soon as possible.